Think of an especially active, hands-on orchestra conductor who shuns the podium, roams the orchestra pit, and urges principle musicians from diverse ensembles to play together and realize the score. That’s roughly what happens during stem cell development, except the conductor is a single “master” growth factor receptor, the orchestra pit is the nucleus, the principal musicians and instrumental ensembles are promoters and transcription factors, and the score is, well, ontogenesis itself. 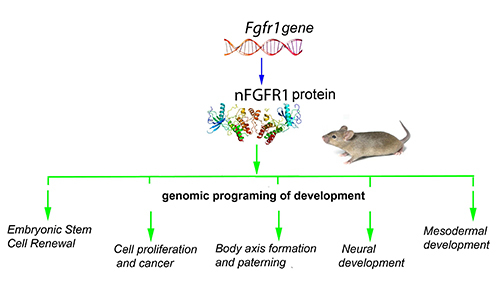 The master growth factor is nuclear Fibroblast Growth Factor Receptor 1 (nFGFR1). It has been known to govern gastrulation, the formation of the three-layered embryonic structure that occurs early in development. And it is known to play a major role in the development of the central and peripheral nervous systems and the development of the body’s major system’s including muscles and bones. Exactly how nFGFR1 accomplishes all these tasks, however, hasn’t been clear. But now scientists at the University of Buffalo (UB) have found that nFGFR1 orchestrates the entire genomic orchestra. In doing so, the scientists, led by Michal K. Stachowiak, Ph.D., are challenging a long-held supposition that specific types of growth factors only function at a cell’s surface. According to Dr. Stachowiak and his colleagues, their work confirms that growth factors also operate from within the nucleus. A more advanced understanding of how organisms form, based on this work, has the potential to significantly enhance the understanding and treatment of cancers, which result from uncontrolled development as well as congenital diseases, the UB scientists say. The new research also will contribute to the understanding of how stem cells work. The UB scientists’ findings appeared April 29 in PLOS ONE, in an article entitled, “Global Developmental Gene Programing Involves a Nuclear Form of Fibroblast Growth Factor Receptor-1 (FGFR1).” The article describes how UB scientists used genome-wide sequencing and loss- and gain-of-function experiments to reveal how nFGFR1 regulates gene expression. The UB scientists used pluripotent embryonic stem cells from mice, and observed how nFGFR1 made it possible for them to differentiate into neuronal cells in response to retinoic acid. The UB team determined that nFGFR1 not only binds to genes that make neurons and muscles, it aslo binds TP 53, an oncogene that is involved in a number of common cancers. Other studies in Dr. Stachowiak's laboratory demonstrate that similar interactions take place in the human genome, controlling function and possibly underlying diseases such as schizophrenia. Targeting of nFGFR1 may allow for the reactivation of neural development in the adult brain in preclinical studies and thus, Dr. Stachowiak notes, may offer unprecedented opportunity for regenerative medicine. Nuclear accumulation of nuclear FGFR1 may be altered in some cancer cells, and thus could become a focus in cancer therapy, he added.